One trick works when doing uphill climbs. Look down, as if tracing your steps. Somehow you forget how steep an incline you’re scaling. Just like in life — uphill climbs are struggles meant to humble ourselves. We struggle to reach the top but the best advice remains: succeed with your feet firmly on the ground. With heads bowed, humility is the true measure of a successful man. 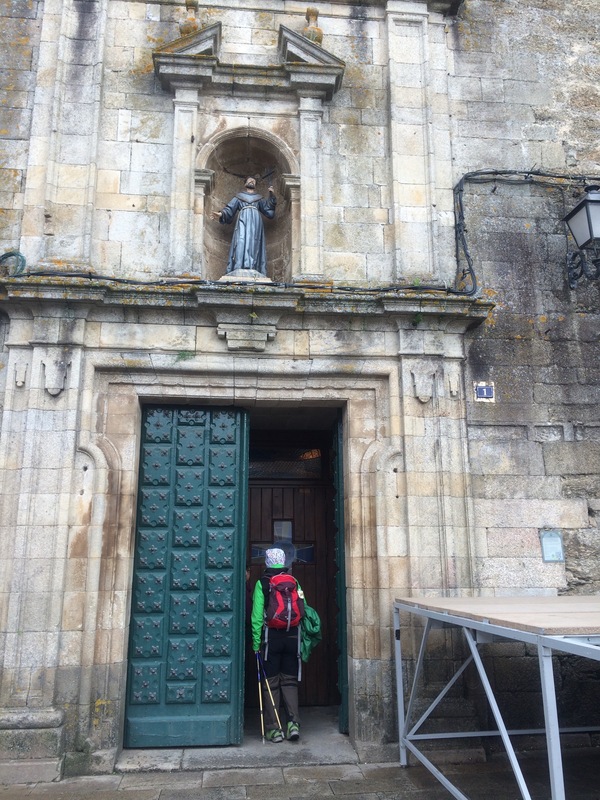 What is the best prayer while walking the Camino? I’d say the best and hardest is to listen. Everyday life has tuned us to many of life’s distractions. If only we can empty our minds of all these cobwebs that easily. It probably starts when our muscles begin to ache and the rhythm of walking dulls our senses to pull through. When we ache without suffering, we listen. The pain is dulled and we prep ourselves to listen. First to our body, then without warning, our mind opens up in prayer to listen. Prayerful thoughts without the prayer recitations. 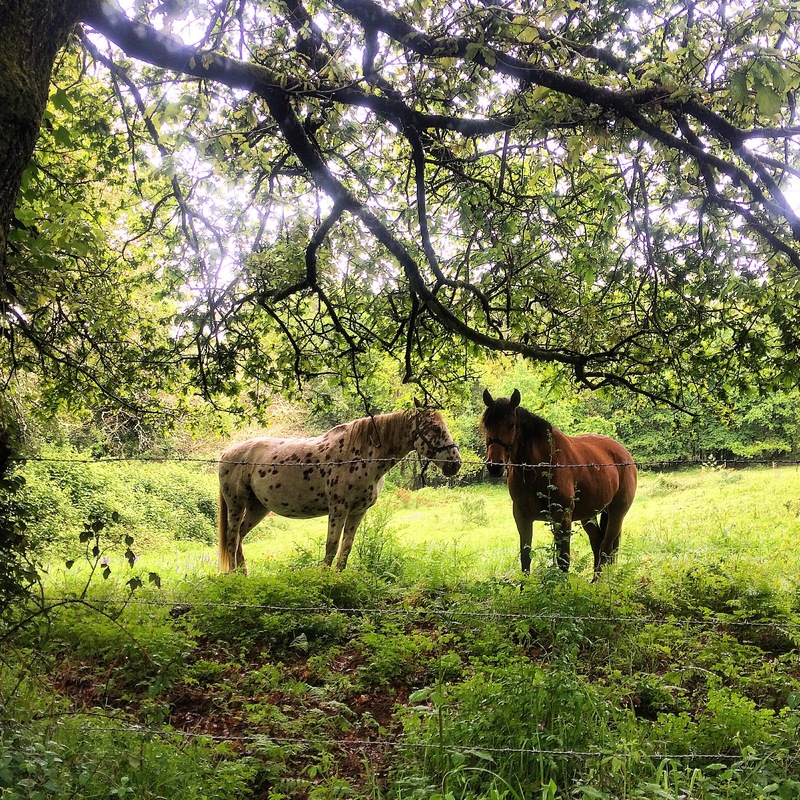 A friend reminded me that communing with Nature is mindfulness. It comes after the initial pain and aches. One’s senses are heightened, fully engaged. Mono-tasking prevails. You walk, and mind how you walk. You look around and the beauty around you cheers you up. His presence felt with every lovely tree you pass, every stone and pebble you step on, every leaf felt crunching under your soles, every fragrance from the forest and woodlands you cross. 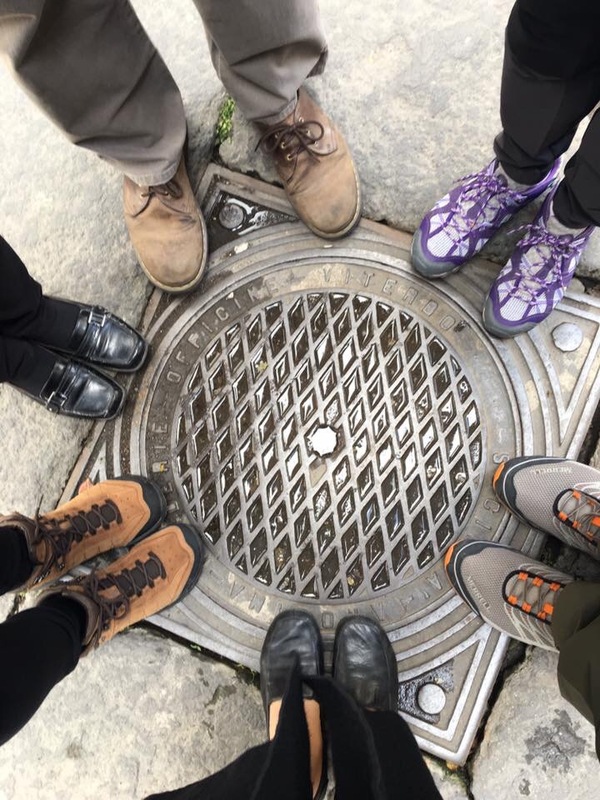 When you walk the Camino, you come across strangers who don’t feel like strangers. It’s not them. It’s YOU. The newfound “openness” within you offers instant familiarity. 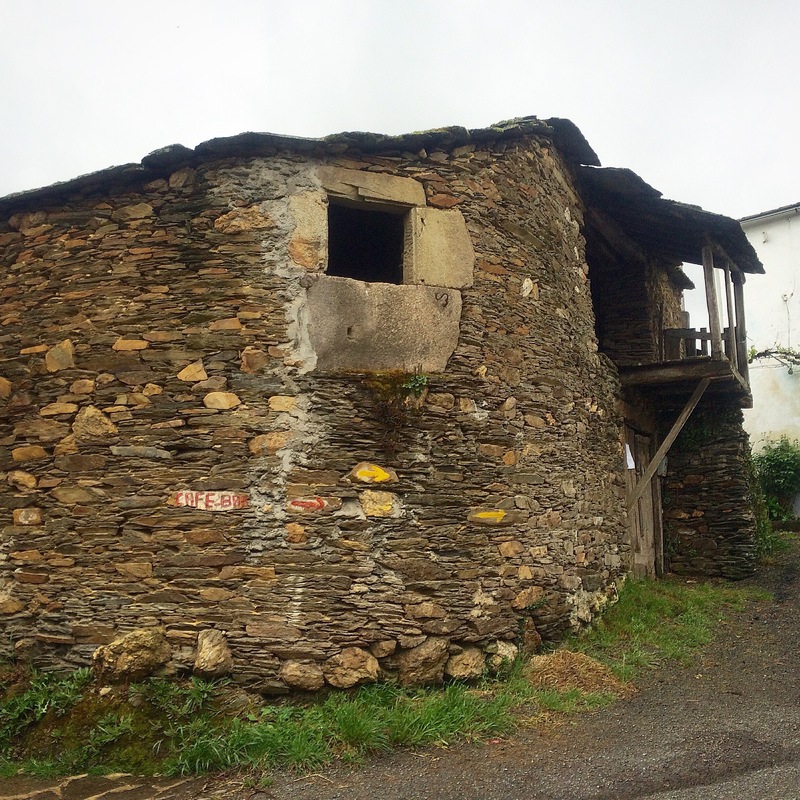 Walked my first Camino SOLO, and the familiar faces of fellow peregrinos made me feel safe and never alone. For a mile or two, you walk with some before bidding them “Buen Camino” – a cue you’d walk ahead or behind, depending on your pace. But for those 2 miles or so, you’re talking initially to a stranger who slowly transforms into a pilgrim buddy. Hardly asking about names, profession and status. Quickly and almost logically, these aren’t important details anymore. 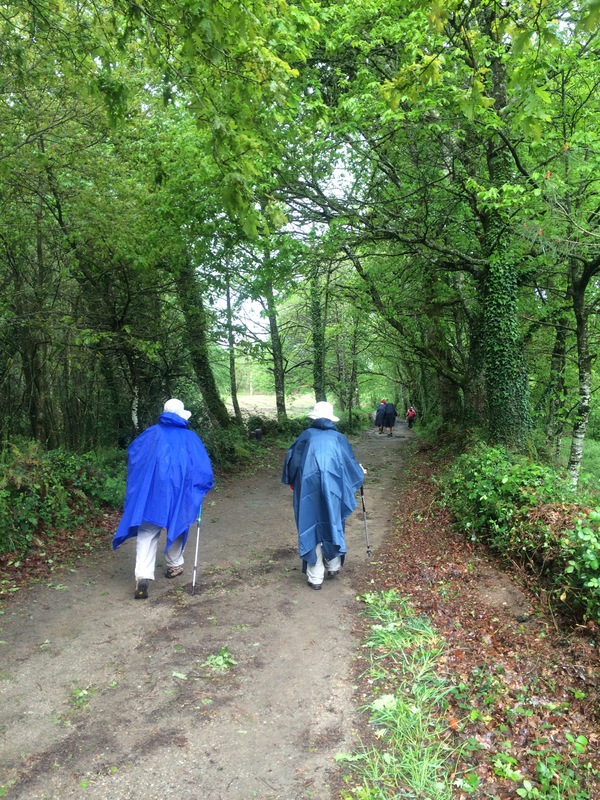 Pilgrim buddies rather talk about how long they’ve been walking, where they started, and how they feel. They may even share meals, clink beer bottles, laugh at jokes or pray together. This I miss. To others, don’t hesitate to walk alone. 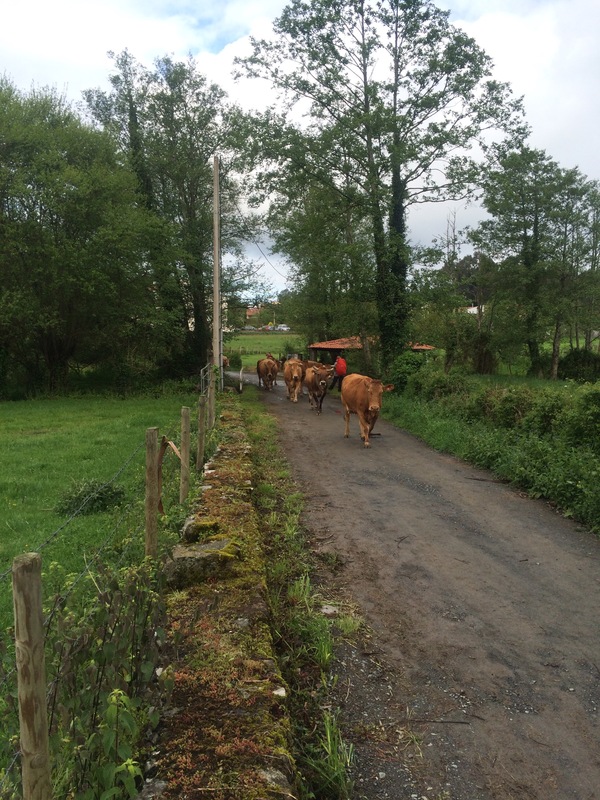 The Camino provides. God provides. The BUTAFUMEIRO (incensory) and the TIRABOLEIROS (incense carriers robed in red). 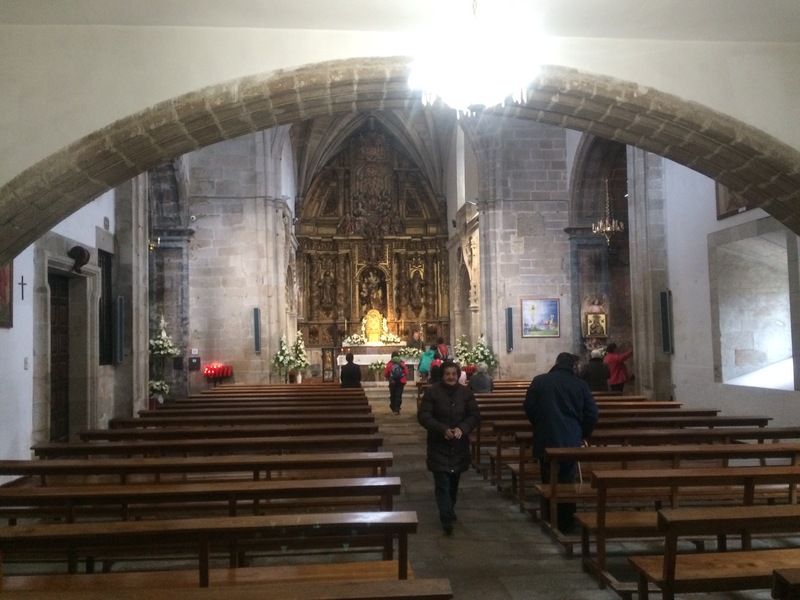 The magnificent scene of the smoking, swinging incensory during the Pilgrim’s Mass in the Cathedral of Santiago de Compostela is forever etched in my memory. 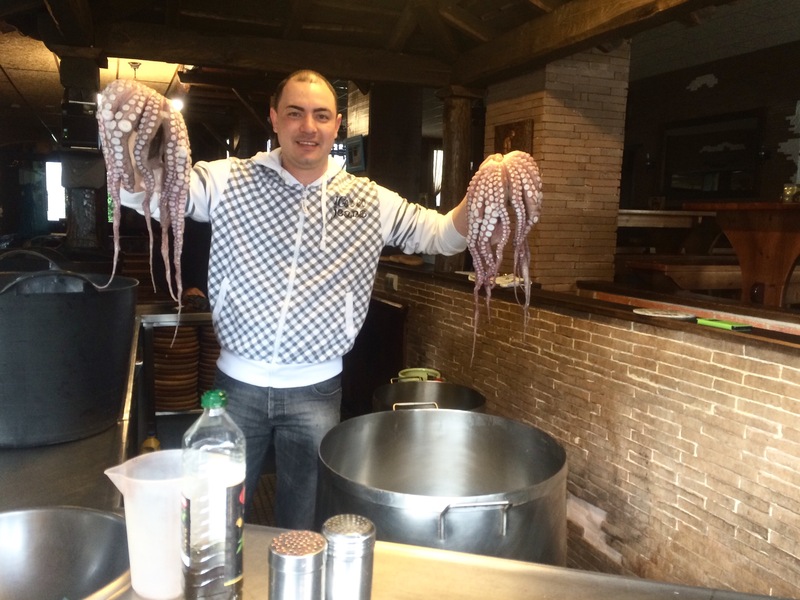 Many come to Santiago de Compostela and consider this the highlight of their trip. I admit it’s quite a spectacle. 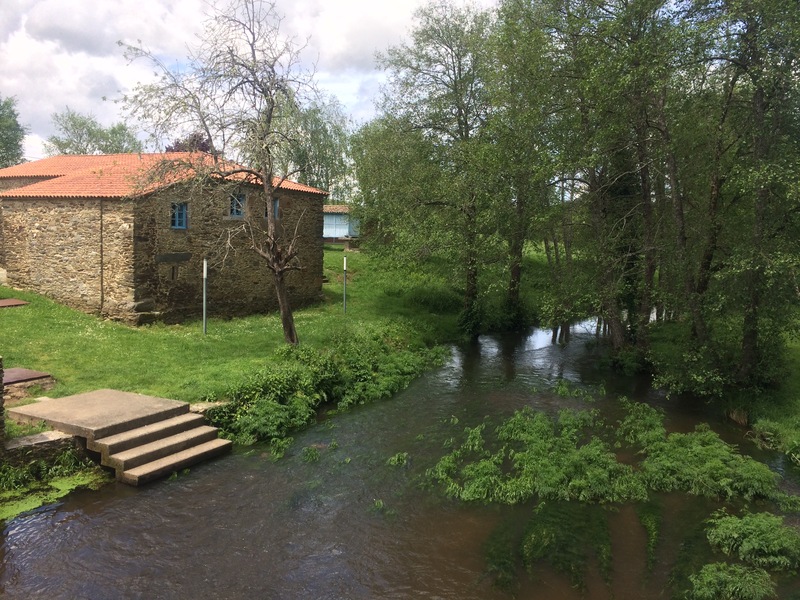 And a fitting end to a 113km camino desde Sarria in Lugo. 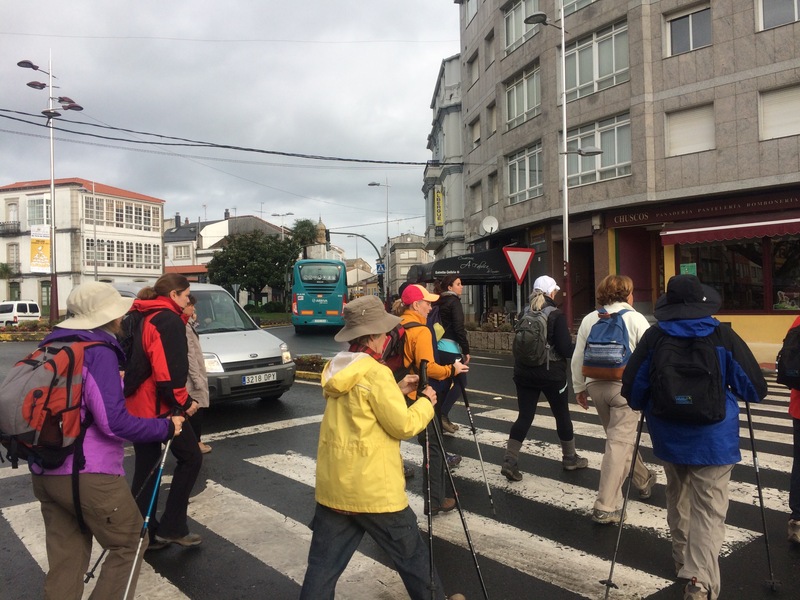 Many others walked longer distances — a few limping along with blistered feet, wind- and sun-burned, some a few kilos lighter. Me? Not a kilo lighter. But I may have developed leg muscles and swollen feet from all the walking. As well as sunspots across my face. I now realize they’re not big issues with me. What are the big issues then? The distance — how can I forget the day we walked 32.6 kms? And the weather. I don’t mind if it’s cold or sunny. But it’s a pain to get in and out of poncho raincoats! 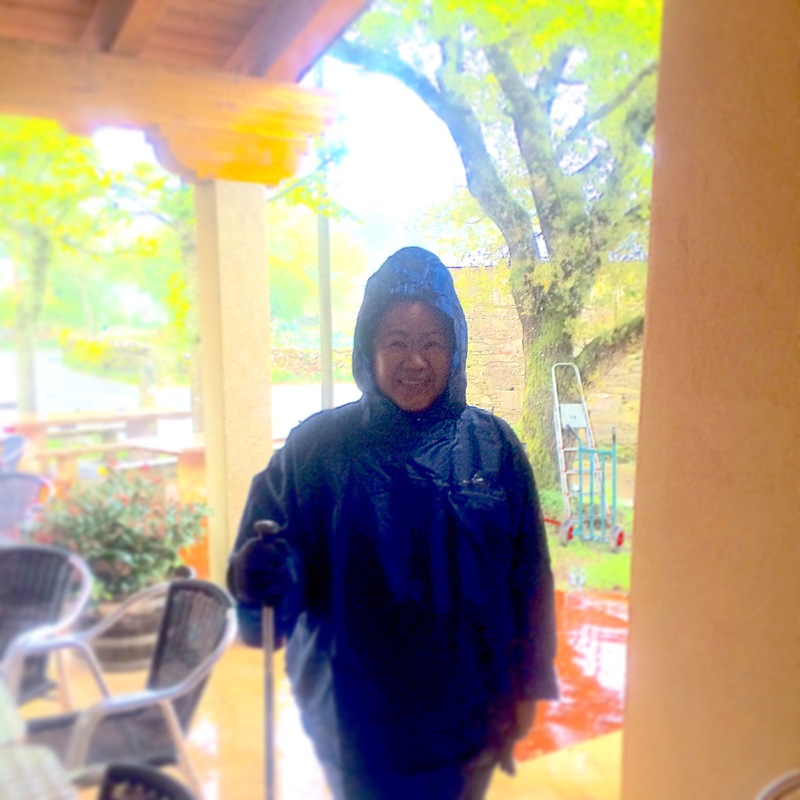 Many times too I’d put on the poncho before my backpack — which meant I had to redo everything so the backpack stays covered by the poncho. The mud? I don’t mind, except when it’s slippery. 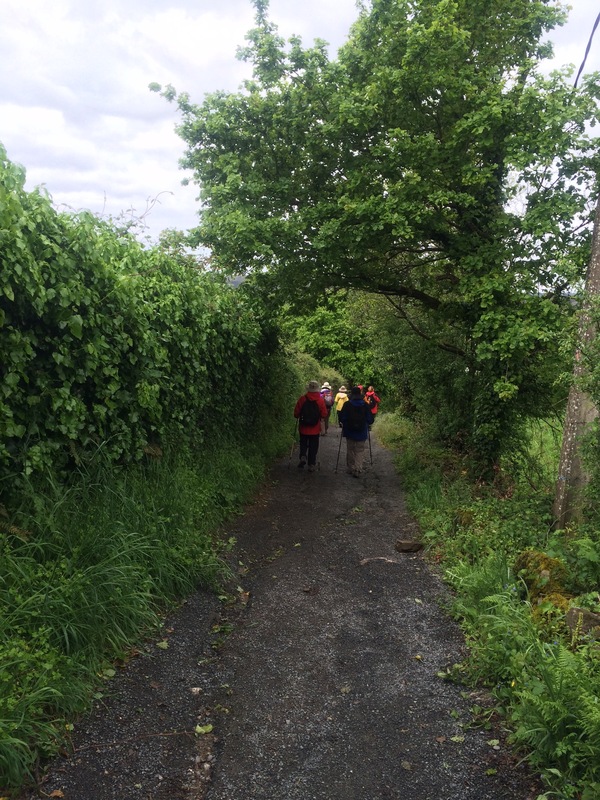 The uphill climbs…. Oh Lord. Thirty years of smoking took its toll. 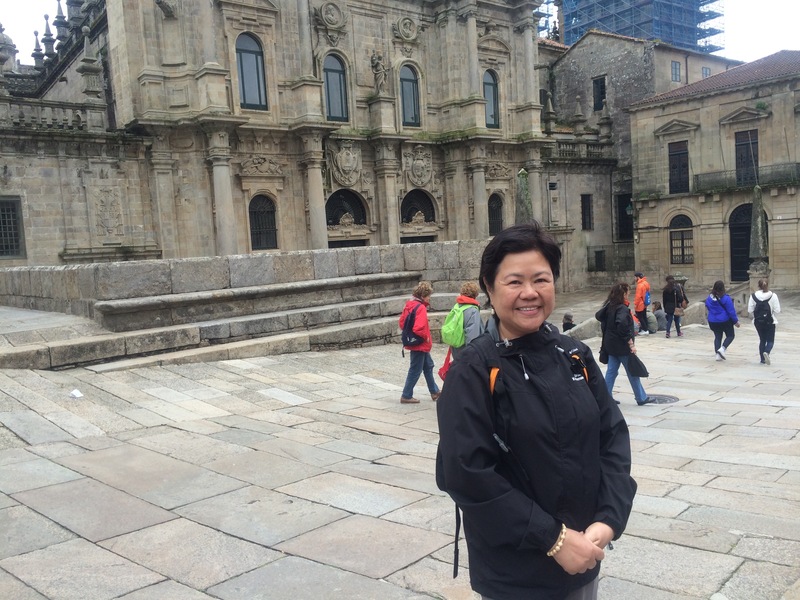 I felt like a really really old lady — hunchbacked and all with a backpack and poncho — with every step I took on steep inclines. Yet still, no big issues. Amused myself enough on those climbs. Happy thoughts! Go slow. Listen to the birds. Feel the sweet, moist smell of the forests. Mind the yellow arrows. Let Maryanne entertain you with her lovely singing voice. Be impressed with 70+ y.o. 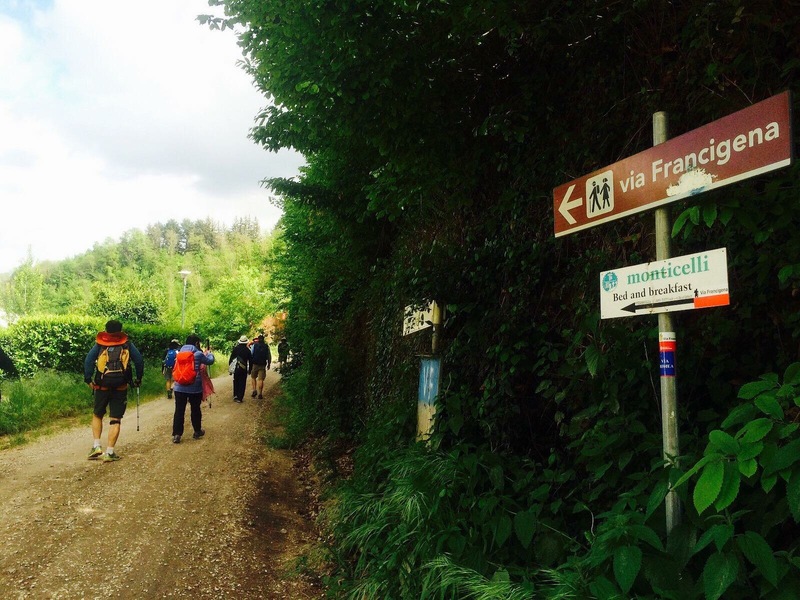 Herta’s camino pace — slow, deliberate and sure. Catch the funny exchange between buddies Carole and Helen. These 2 kept me amused often enough. May and Beth will keep you distracted from the muscle pains as they regale you with many interesting and funny stories. Such good walking companions! When Ann W and Sue wait up at the bend for you, and ask how you’re doing, you feel touched by the kindness. 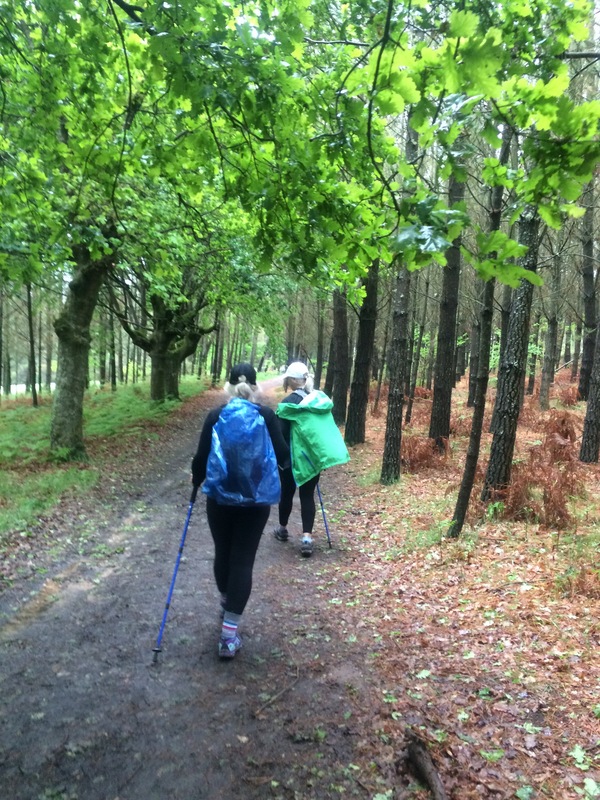 And how inspiring to find a mother-daughter team walking with you. 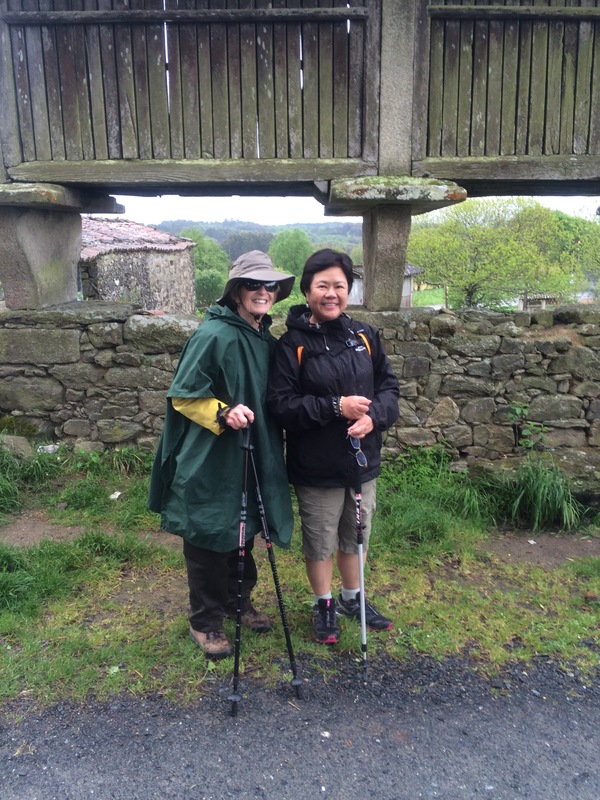 Ann C and Missy make me consider another camino with my grandchildren. That is, if I can keep myself in good shape like Herta! And Chus. What would we do without young, lovely Chus? Thank you all, witches. I mean, ladies. Missing you all already! 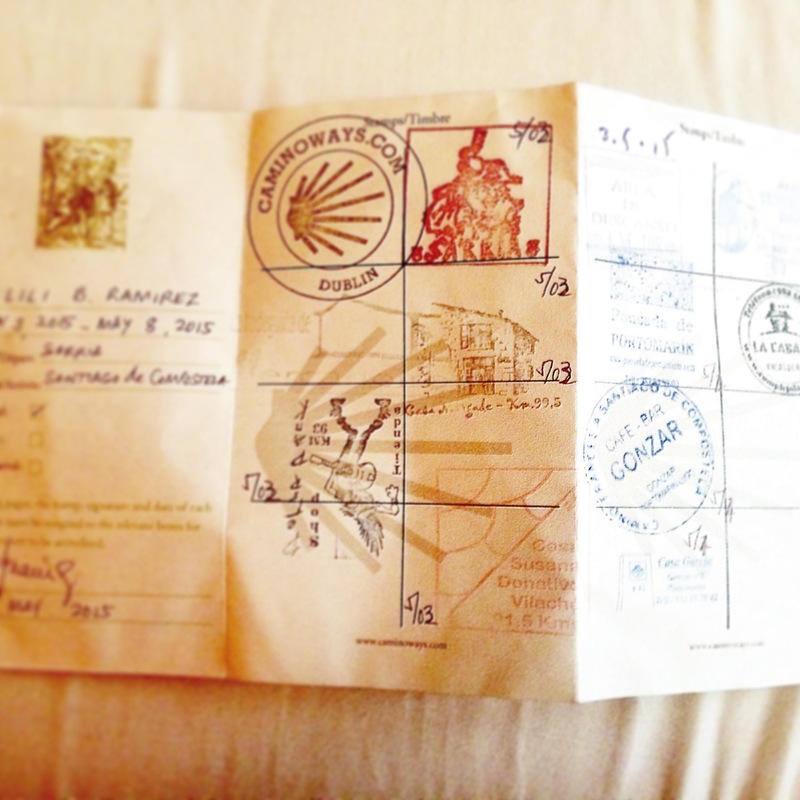 So, my camino ends for now. But the memories linger. We made it! The peregrinos are coming to town. 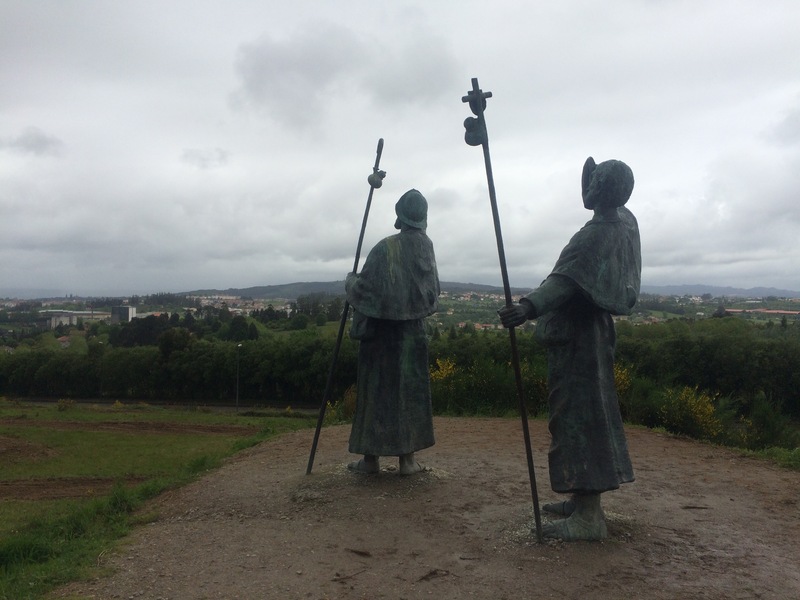 It’s a Friday and the noontime and evening masses for pilgrims at the lovely Romanesque cathedral in Santiago de Compostela will have 8 robed men swinging the butafumeiro across the isles. 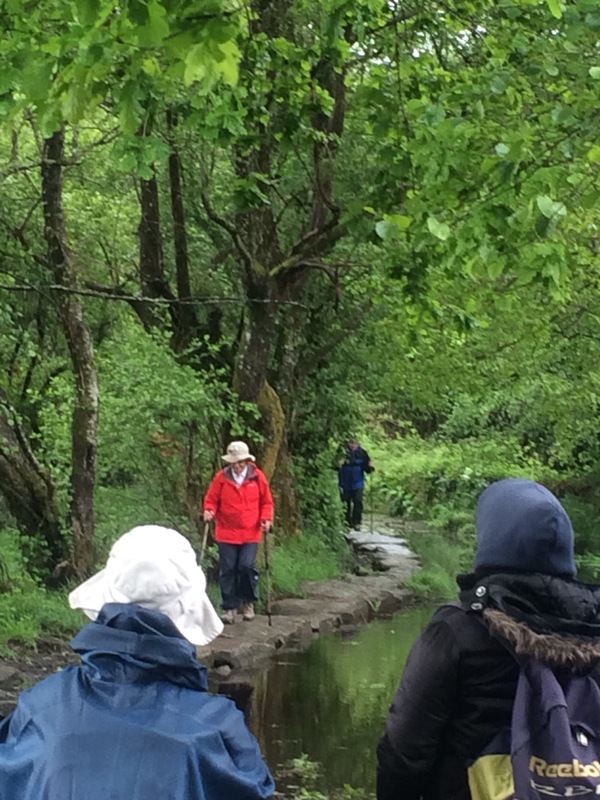 As I soldiered on on this wet and windy day, many younger pilgrims zoomed past me, unmindful of the cold and rain. They could reach Santiago in time for the mass at noon. Believe me, getting in and out of your rain poncho can be a mood spoiler. Much more so for those wearing rain pants. But it’s the last day. Our last 15 kms. 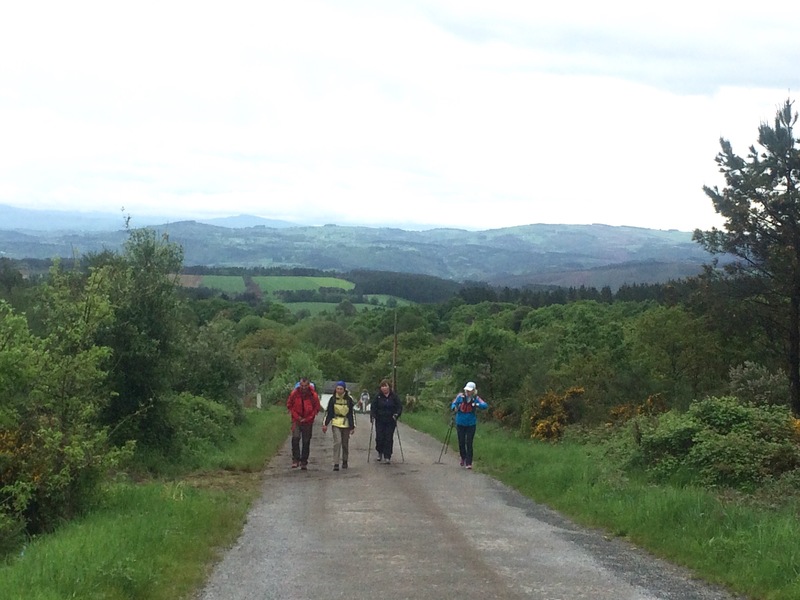 As the Irish, German and locals zipped past on foot or on bikes, each had an expectant look. 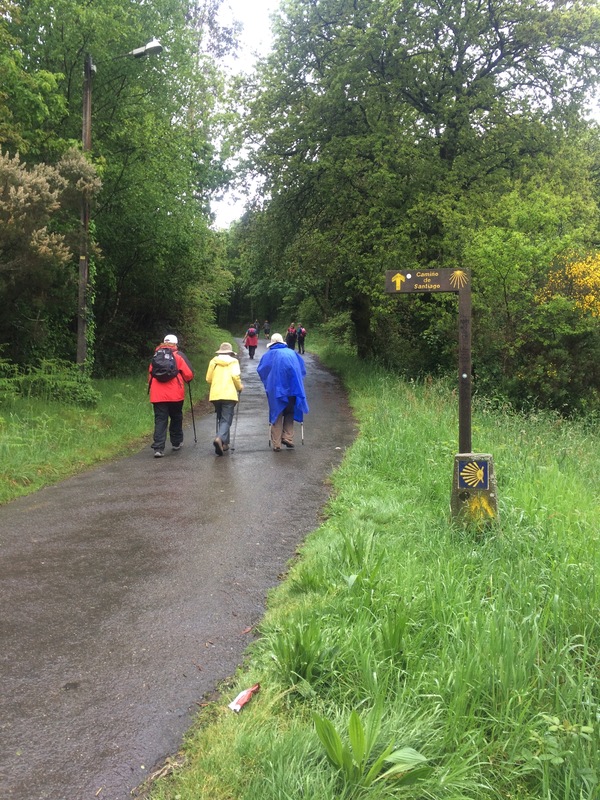 “Buen Camino” which means “Have a good camino or walk” has also substituted for “hello” and “excuse me” or “move aside” as when they overtake you along the trail. 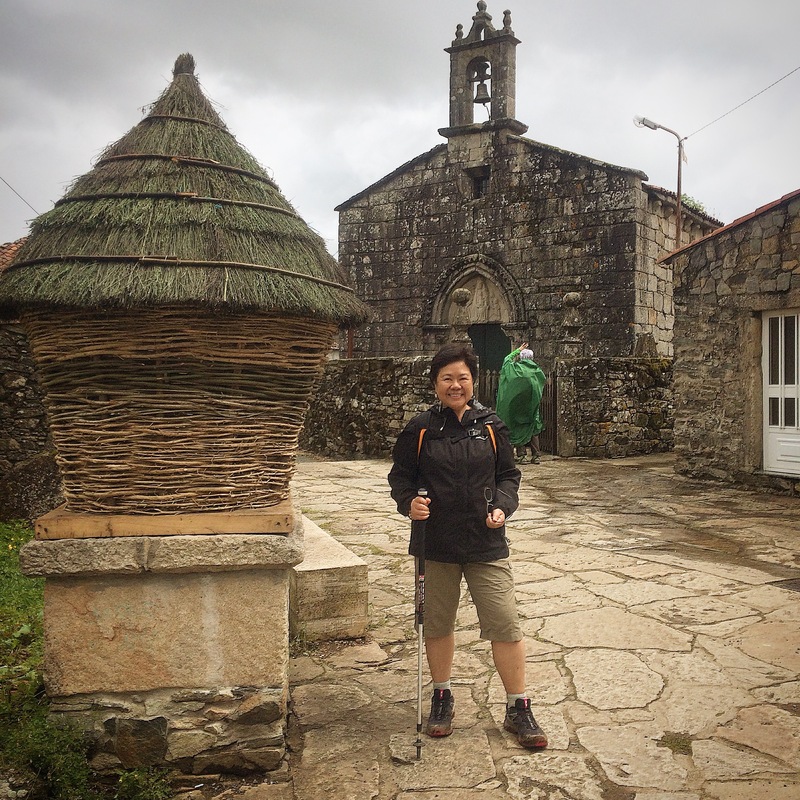 Most peregrinos stop at Monte do Gozo to have their first glimpse of the spires of the Cathedral of Santiago de Compostela. 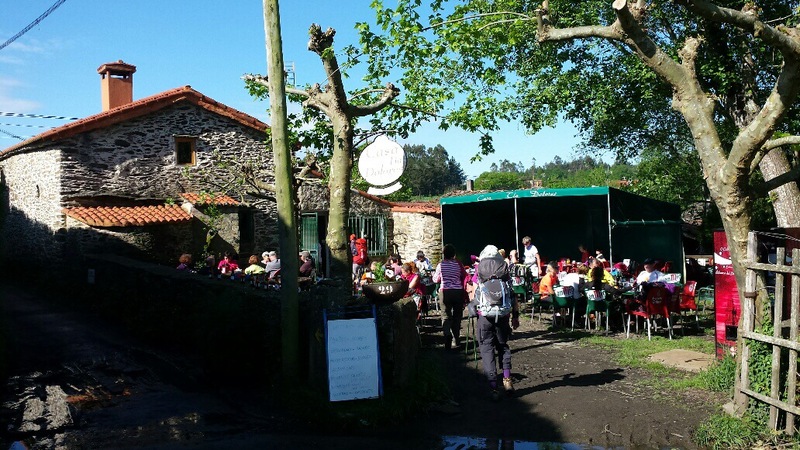 It’s the last hill before reaching Santiago, about 4 kilometers away. Windy, overcast sky, cold and wet, we made a collective sigh of relief that the “end” is near. Our hearts felt the church spires beckoning us to march on. As soon as we stood before the Church, the dam broke. I cried. Such joy to be here. Such an honor to make this pilgrimage. 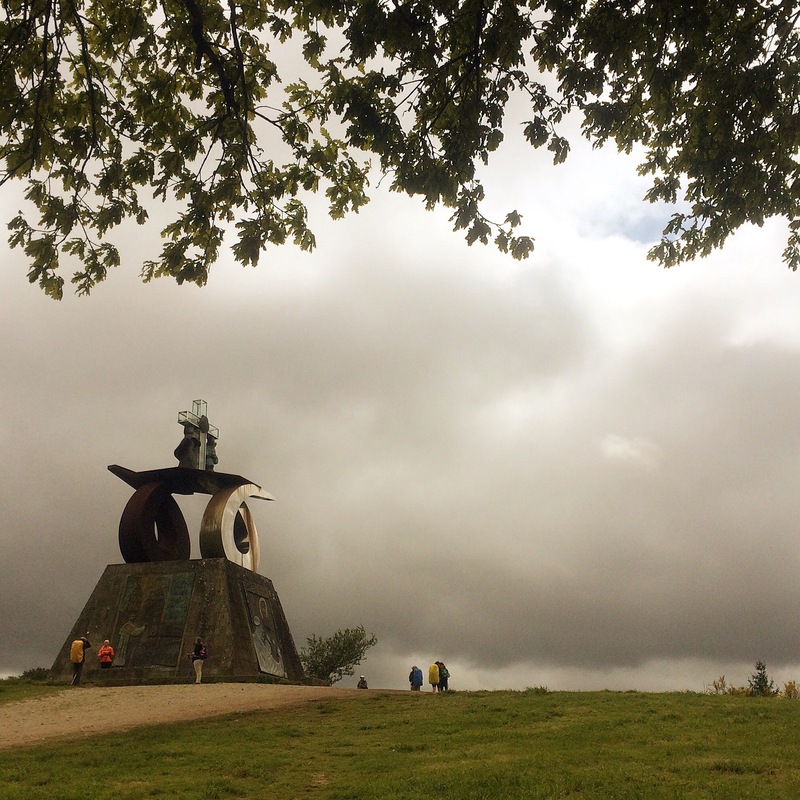 All worth the wet, cold, windy camino days. The swollen feet from all the walking and the swollen hand from holding the shaft or walking stick. This “jubilada” (retiree — which is what they registered at the Pilgrims’ Office when asked my profession) made it! 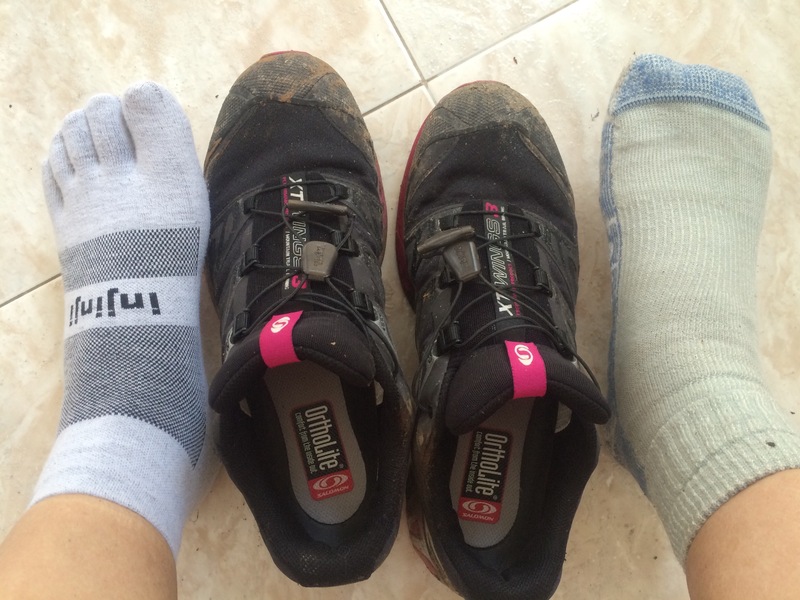 And I’m happy that we made this hike in 6 days, feeling every step of the pilgrimage. Gracias, Señor. The Pilgrim’s Mass at 7:30pm had the entire cathedral filled up as early as half hour before the service. Came a good hour early and claimed front seat. Soon after the service, the tiraboleiros prepared to swing the metal thurible. Botafumeiro is that giant thurible or incensory that they swing across the isles, up and down, pulled by 8 men in deep red robes. 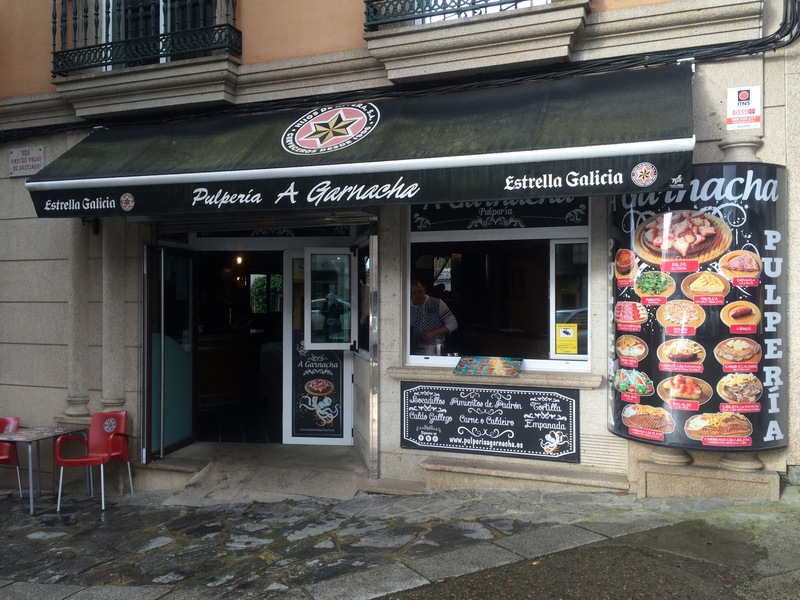 Botafumeiro in Galician means smoke-expeller. 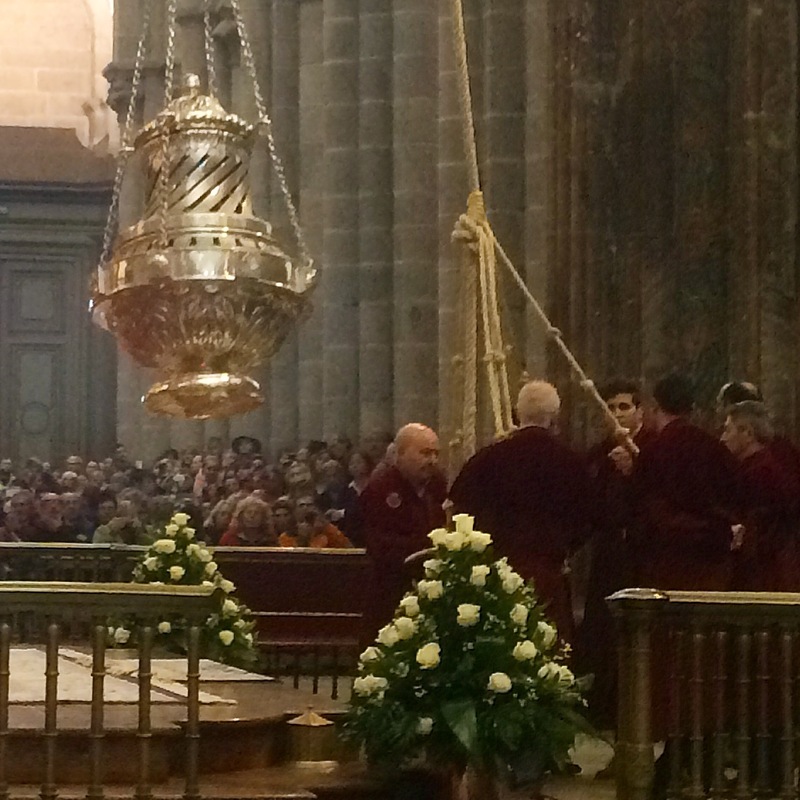 And the robed men in charge of the swinging thurible are called tiraboleiros which mean incense carrier in Galician. Such a fitting end to this pilgrimage. Feeling blessed. Unlike those who made the 300-800km journey (or even longer), I can’t claim any lifechanging miracle. But I have a newfound discovery. Life, as with uphill climbs, need NOT be rushed. It’s hard. But taking breaks –a breather– every so often makes a seemingly impossible task doable. Often enough, I had to remind myself to slow dow and walk in a relaxed manner. As with life, we sometimes do things just to get it over with. 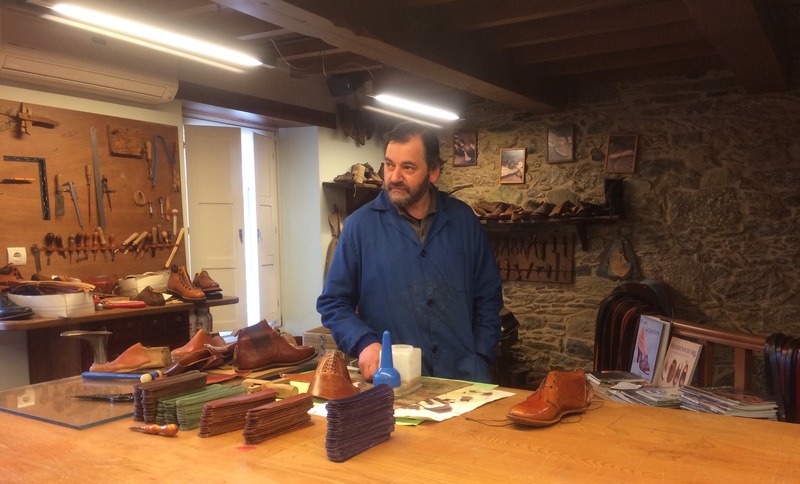 In this Camino, I discovered SLOW works. 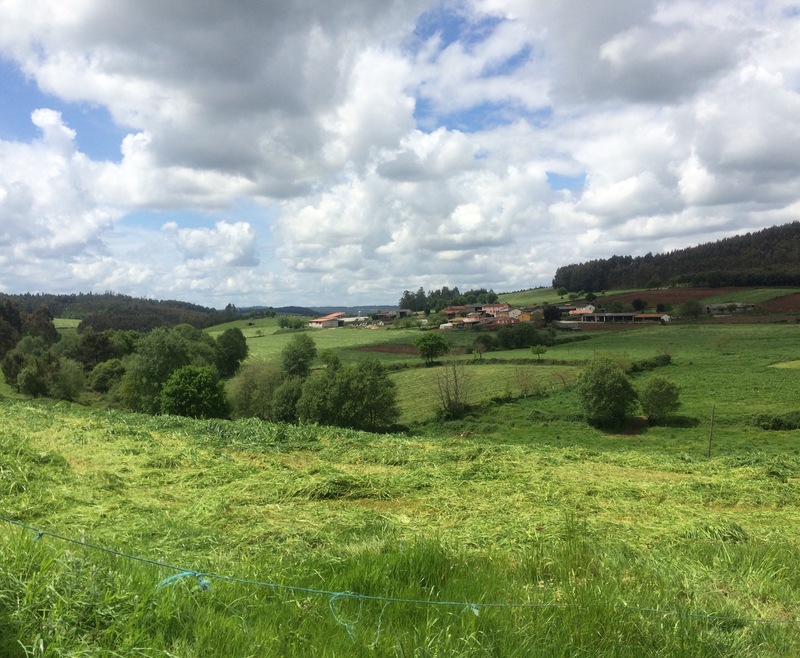 CAMINO DAY 5: Can you believe it? I CAN. HARDLY. BELIEVE IT. 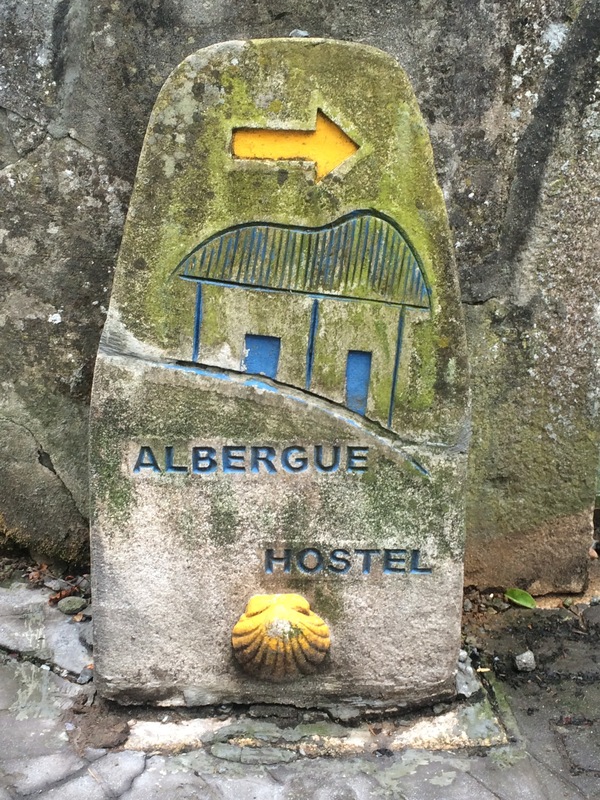 Five days of walking from Sarria in Lugo to Amenal, just 15 kms away from Santiago de Compostela. When we went past the 20 km marker, I felt like screaming for joy. Never mind that the next 5kms towards our hotel seemed like an eternity. We were tired, after all. 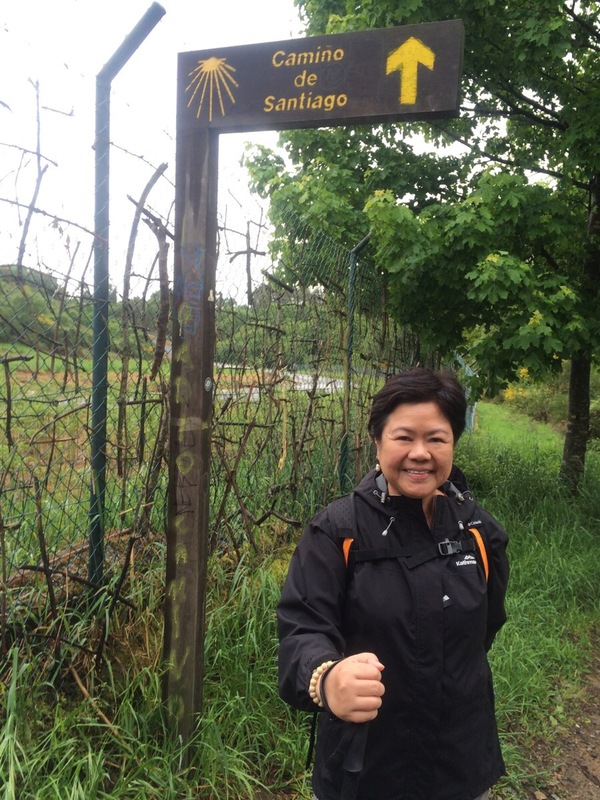 Been blessed with enough stamina and willpower to hurdle this camino which our guide Maria says isn’t exactly 113 total, but much more. 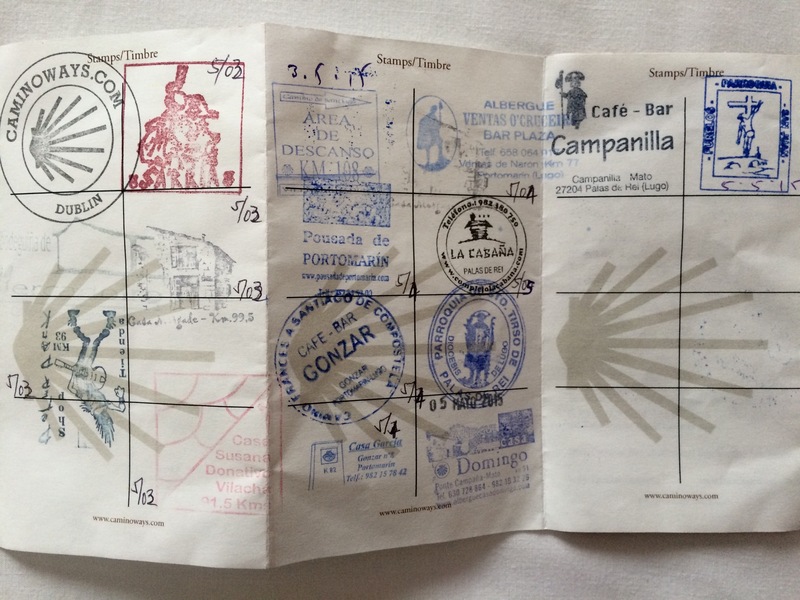 In fact, she said we’ve actually done the minimum 100 kms yesterday to earn a Compostela. She measures our mileage each day but only tells us when day’s over. A little white lie, Maria would say. But naaaahhh. 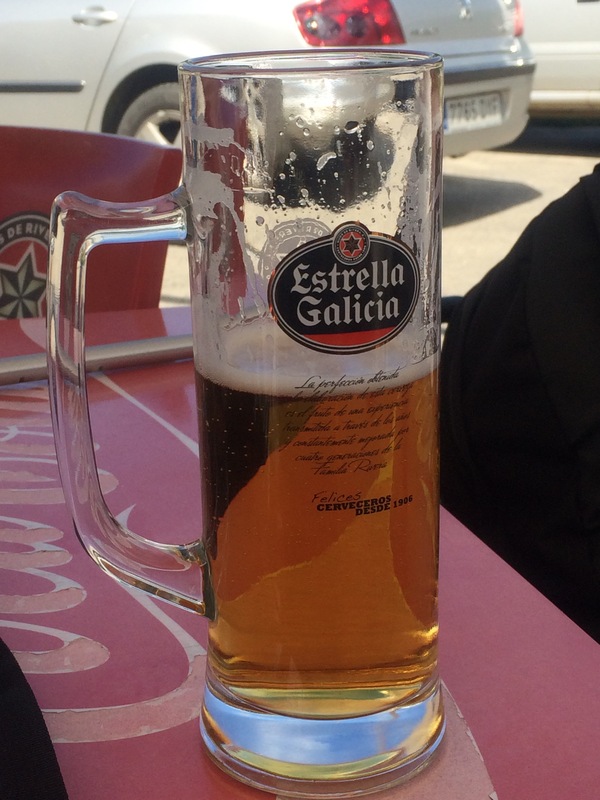 Having gone this far, we’re not about to hop on a cab to Santiago. 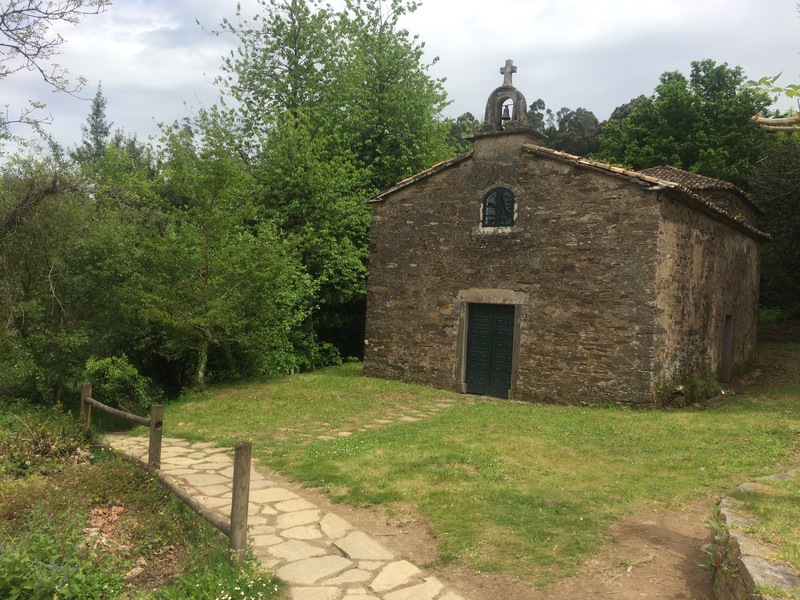 Well, there’s only tomorrow’s 15 kms towards Santiago de Compostela, so I feel more confident. Tired? Very! And blessed. No blisters. My little toes gave me problems since Day 2, but me and my toes will survive this. My right knee started feeling funny after 12kms but my new friend Herta gave me something to spray on it to ease the pain. I am excited for tomorrow’s final leg and happy it’s the last day. My endurance would be severely tested beyond tomorrow, for sure. Birds chirping, feeling the “crunch” upon stepping on fallen leaves, crossing a bubbly stream, a slight drizzle, muddy paths, and cow manure here and there. 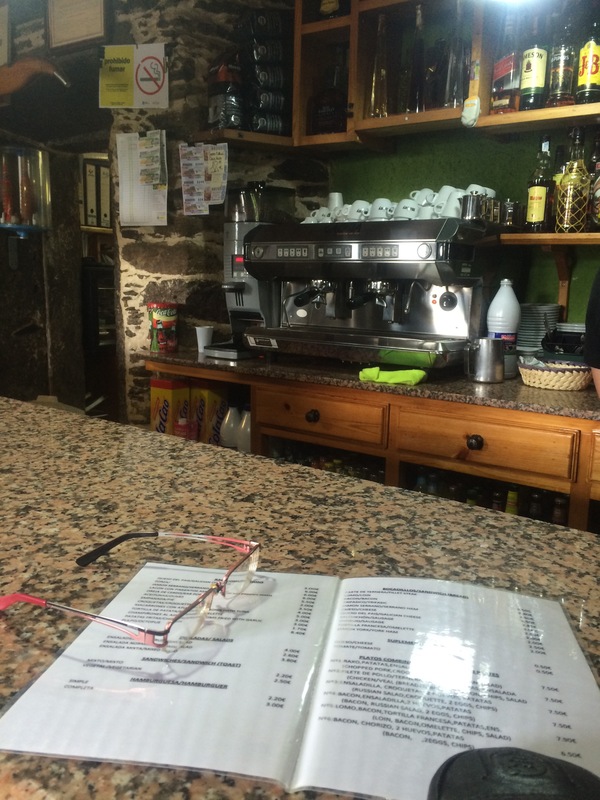 It’s hard to deprive one’s self with a copa of vino or cerveza. I should stop. Dehydration issues and balance issues and all. Even the vino during dinners, much that I enjoy them, should be given up. One of the 4 ladies I’m walking with told me that she’s giving up smoking in this Camino. “That’s great” I said. 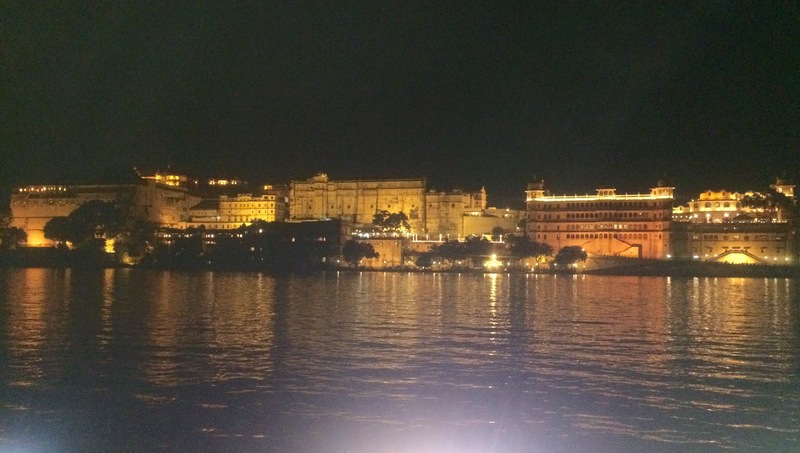 To which she smilingly replied “…. just that I don’t smoke”. Touche! Let me have my vino! 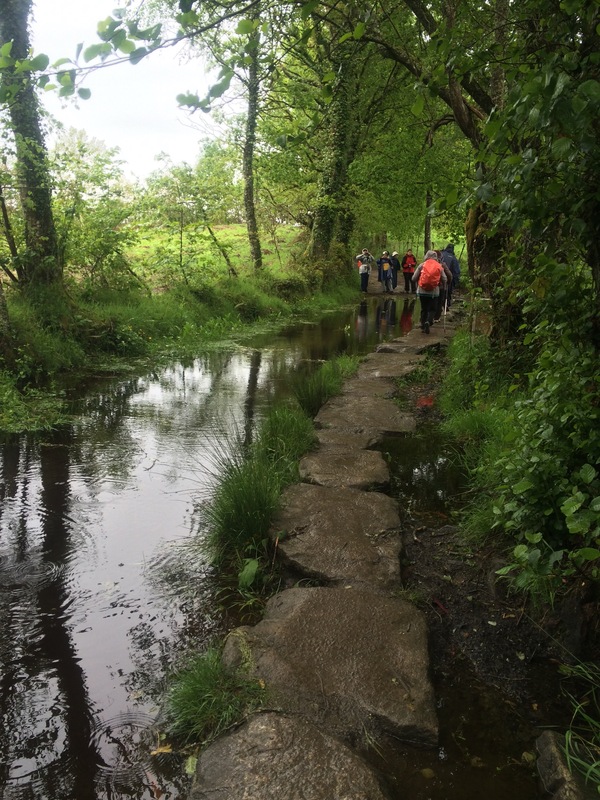 There’s a lot of my musings and ramblings as my knees struggled through the uphill climbs, downhill walks and flooded/muddied paths. Many oxygen breaks happened here. I’m good walking some distances on flat, dry surfaces. And without a backpack! But I’m compelled to use a backpack to carry my change of socks, vaseline, and fleece vest. Oh ok, the chocolate and energy bars are in there too. 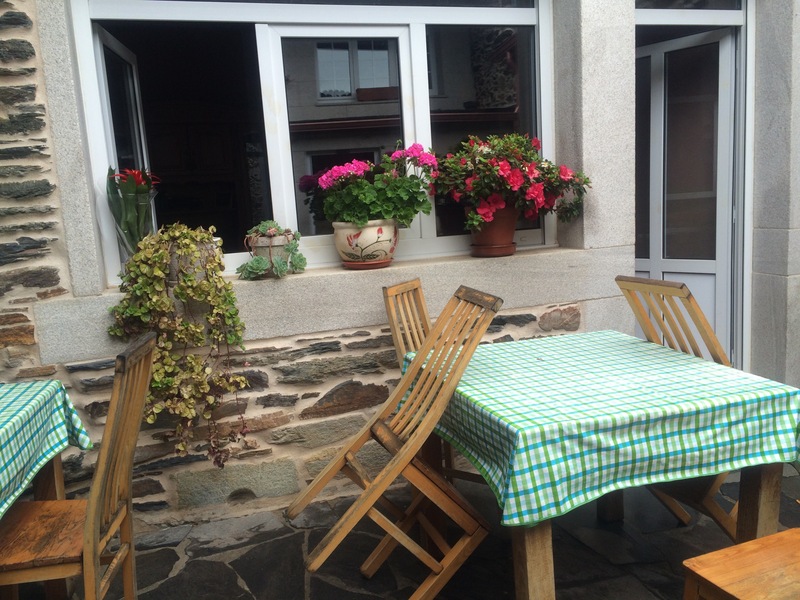 Galician weather is hard to predict. Funny how I don’t miss sunny spells (I break out in sweat!) and how thankful I am whenever it rains just when we’ve stopped for some coffee or caldo! 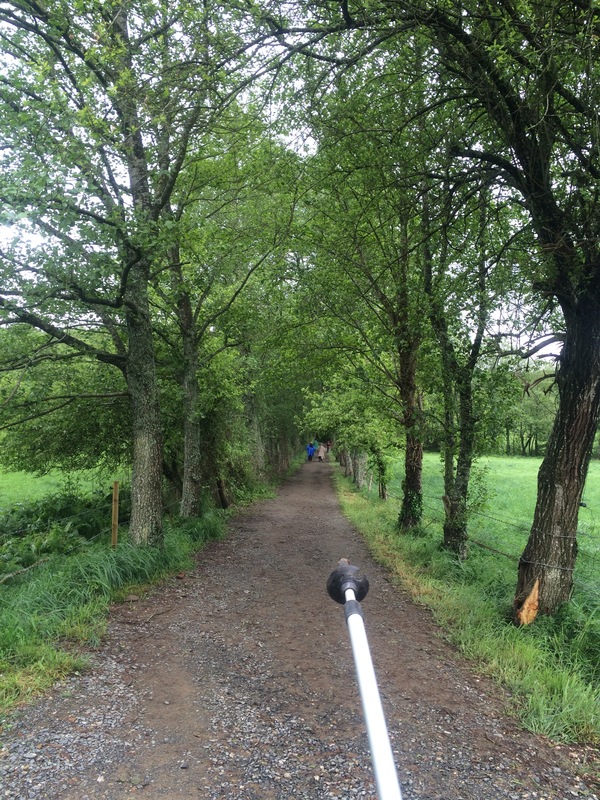 But today, it rained again on the last leg of the camino. Too lazy to put on my poncho. Just trudged along hoping the hotel is at the next bend. Being close to Nature makes for good contemplative monents. Whenever a gust of wind ruffles your hair, you cant help but smile. The aroma of cow manure brings you back to your senses, but in a positive way. For the life of me, I welcomed the scent of farm life. 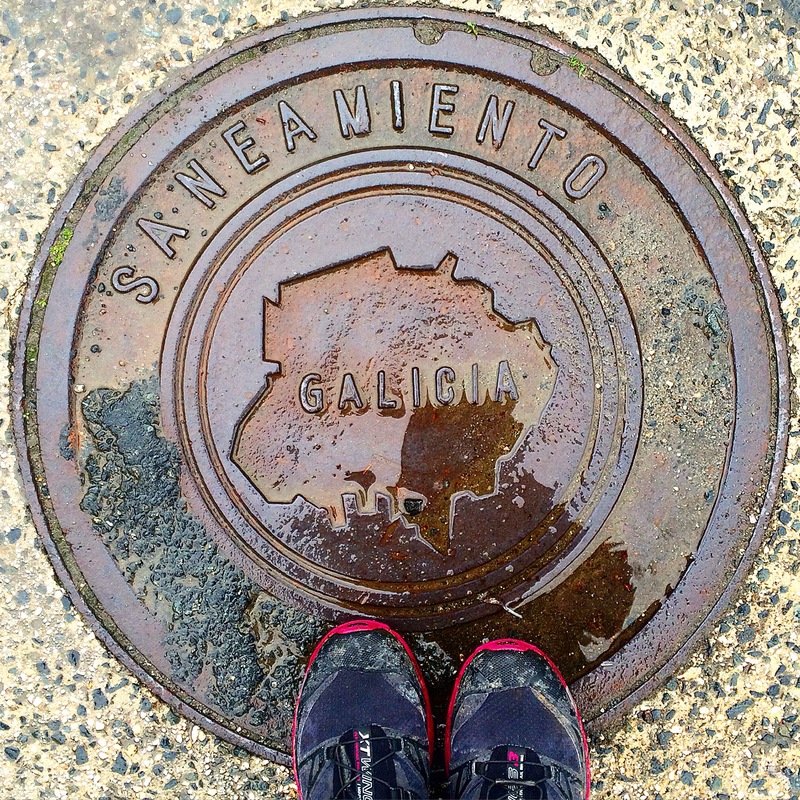 The simplicity of Galician life renders you grateful that you’re doing this walk, able to count your many blessings. 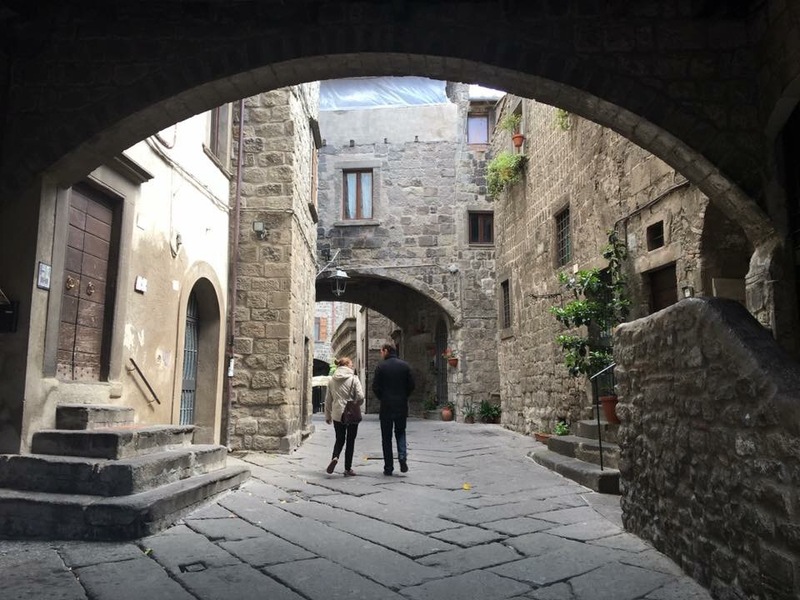 A pilgrimage or an adventure? It is both for me. I wanted to challenge myself as much as I wanted to do my “spiritual retreat”. I’m having my moment. Can’t even bring myself to complain when it rains, gets really cold or when I couldn’t figure out where to step on a muddied path. Really.